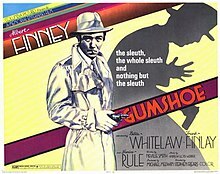 Gumshoe is a British 1971 film that was the directorial debut of director Stephen Frears. Written by local author Neville Smith, who appears as Arthur, the film is set in Liverpool with Albert Finney playing the role of Eddie Ginley. Ginley is a bingo-caller and occasional club comedian who dreams of being a private eye of the kind he knows from films and pulp novels. Having put an advertisement in a local newspaper (the Liverpool Echo) as a birthday present to himself, Ginley is suddenly contacted for what appears to be an actual piece of detective work. The film has many comic moments as it switches between detective novel and affectionate spoof. It has some shots of Liverpool buildings that have long since been demolished, including the employment exchange on Leece Street. Several scenes in the London part of the narrative take place in and around the occult Atlantis Bookshop. Gumshoe was the first of two films with original music scores by Andrew Lloyd Webber (the other was The Odessa File, in 1974). Some of the music was re-used in Lloyd Webber's musical version of Sunset Boulevard (1993). Roy Young recorded the song "Baby, You're Good For Me," written by Lloyd Webber and Tim Rice. Despite its relatively lightweight tone, Frears's film is not without its contentious moments. TV broadcasts are nowadays rare because of Ginley's use of racist language and insults (such as calling a black African character "Mighty Joe Young" and a "spade"). Another scene was significantly (and clumsily) shortened before release because of its detailed depiction of a heroin-user preparing and taking his 'fix'. After years of unavailability, Gumshoe was released on DVD in 2009. ^ "Netflix available films". Netflix.com. Retrieved 13 September 2010.